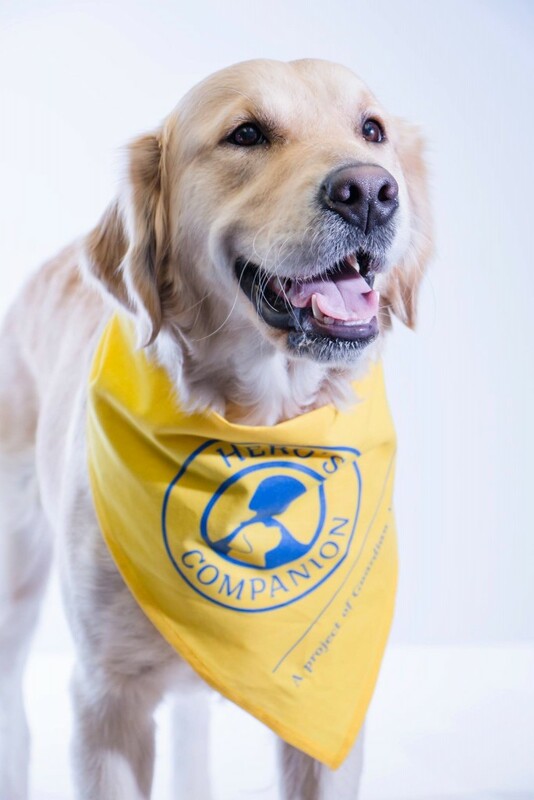 Hero’s Companion organizes and runs a therapy dog program in which tested and certified therapy dogs visit hospitals (both military and civilian), rehabilitation centres, and anywhere else we are welcome and needed! Currently the therapy dog program is active in the Kyiv region, with plans to expand the program across Ukraine in the near future. 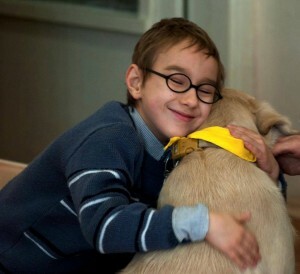 Therapy dogs can do wonders when it comes to lifting the spirits of those around them. They provide emotional and psychological support, bringing comfort and a sense of calm to recovering soldiers, which in turn helps them open up and built constructive relationships with medical health professionals..
There’s also a scientific reason behind why dogs make us feel good. Interaction with canine companions stimulates our brains to create oxytocin, a hormone that the brain excretes during certain social interactions. Scientists have found that oxytocin: helps us bond with our friends, romantic partners, and family (especially children); prompts our bodies to heal themselves; helps us trust each other; and reduces anxiety, fear, and stress. 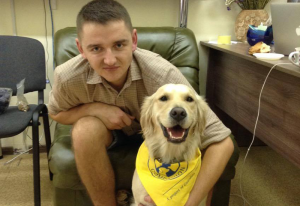 The Hero’s Companion therapy dog program has been warmly welcomed during our visits to military hospitals, rehabilitation centres, and veteran houses in the Kyiv region, and we look forward to continuing bringing four-legged friends to those who could use a little extra cheer. The therapy dogs work in different ways, from simply being present and bringing comfort during therapy sessions, to engaging patients in tasks aiding in physical rehabilitation such as walking, throwing a ball, or brushing the dog. 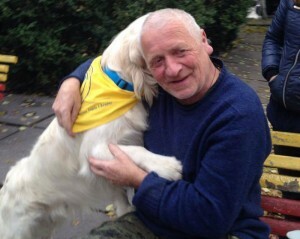 Due to popular demand Hero’s Companion therapy dogs are now also working with children affected by war as well as with special needs children. The dogs have already worked in refugee centres, camps for internally displaced children and children who have lost parents to the war, as well as in different schools in Kyiv with special needs students. The furry companions play different roles according to the needs of the children; some sit quietly, providing a warm and non-judgmental presence for the children to hold on to and sit beside, while others engage in physical activities with the children such as walking, training, and playing. The dogs’ interaction with the children provides a calming effect, boosts positive relations with caregivers and peers, increases focus and attention, and increases confidence and feelings of well-being while decreasing nervousness, anxiety, and fear. Unlike with service dogs, interaction with therapy dogs – such as petting, playing, and walking with them – is allowed and encouraged! Hero’s Companion therapy dogs are distinguishable by their yellow bandanas with the Hero’s Companion logo on them. If you see one of our therapy dogs don’t be shy – come up and say hi! If you (and your dog!) are interested in volunteering in our Therapy Dog program, please visit “How to Get Involved” page.